Fiscal year 2016—another year in the downward spiral of Kansas finances after unaffordable tax cuts. Financially, Kansas lived day-to-day, and in the end only managed to cross over to the next fiscal year by not paying bills. And all that trouble earned Kansas another credit rating downgrade. July 30, 2015—The governor uses allotment authority to order $38 million in budget cuts and $63 million more of one-time transfers. This action comes less than one month into the fiscal year and right on the heels of the longest legislative session in Kansas history. November 10, 2015—To keep the general fund solvent the governor uses allotment authority again, this time to make $124 million in expenditure cuts and one-time transfers. March 10, 2016—The governor uses allotment authority to hit universities for $17 million in immediate cuts. May 18, 2016—Once again the governor’s allotment authority is used, this time to cut the approaching FY 2017 budget by $97 million, mostly through reductions to universities and Medicaid providers. May 27, 2016—The budget director announces that the 4th quarter payment to KPERS will be delayed until FY 2018, reducing expenses in FY 2016 by almost $100 million, but adding that expense plus 8 percent interest to what must be paid in FY 2018. 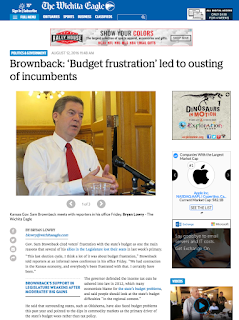 June 22, 2016—The budget director announces at a State Finance Council meeting that the state will need to delay the last school payment of the year in order to close FY 2016 above zero, and then recommends that Kansas borrow $900 million on July 1, so that the state will have cash to operate in the new fiscal year. No wonder it seems that Kansas has been precariously on the edge. We were. We still are. 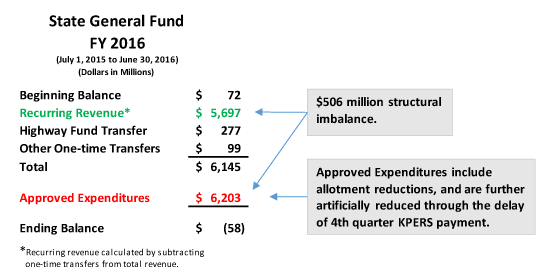 Spending in the FY 2016 budget was constrained from the start, repeatedly cut during the fiscal year, and lowered further by delaying the fourth quarter KPERS payment, but in the end, expenses were still $506 million above recurring revenue, and that’s recurring revenue which included a big sales tax increase. To bridge the structural gap, $277 million was transferred from the highway fund and $99 million from a series of other funds, and the small beginning bank balance was depleted. (The highway fund is also being used to directly pay expenses for things like school transportation.) Without all of those transfers the general fund would have been deeply in the red, but even with them, the general fund did not balance. To finish, the state pushed FY 2016 school finance bills into FY 2017 and then paid them with borrowed money in order to keep FY 2016 in the black on paper. The $506 million structural gap, the lack of any cash reserves, the extraordinary use of one-time transfers, the delay of bill payments, and no plan in place to fix any of it caused Standard and Poor’s to again downgrade Kansas’ credit rating—our financial report card. Unaffordable income tax cuts produced all this! Next up for trouble: FY 2017.